Too many people in the West, particularly in the US, seem to think that refugees are moochers who want to selfishly come here to get something for nothing. We have little to no idea how refugees become refugees, and more tragically, we often just don’t give a damn. It’s not our problem, right? “If these people would just work a little harder or be a little smarter, they wouldn’t find themselves in such a position,” seems to be the prevailing attitude. I used to teach 20th century history and I taught at both the college and high school levels. Whenever we got to Nazi Germany, a student would invariably ask, “Why didn’t they just leave” about the Jews. And so I would try to explain the various reasons why people wouldn’t want to leave their home country in the first place (would you leave so easily? ), and then the very real financial and geopolitical obstacles that prevented emigration later (ever heard of the SS St. Louis?). 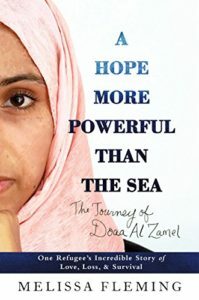 In A Hope More Powerful Than the Sea, Melissa Fleming of the UNHCR tells us the story of teenager Doaa Al Zamel, a Syrian refugee who nearly died in her tireless quest to live her life as she chose and simultaneously help support her family. Through Doaa’s eyes, the reader will learn about life in Syria before war tore the country apart and forced nearly half the country’s population to become refugees. Doaa and her family faced life-threatening situations in their own country and later in Egypt as refugees caught up in the Arab Spring movements and the ensuing civil unrest. But Doaa also tells us about her family, her friends and her dreams, and the reader sees that Doaa and her community are familiar and relatable. They worry about jobs and school, they rejoice in family, they have dreams for the future, and they love their country. This makes Doaa’s departure from Syria and later from Egypt all the more painful to read, and her resilience and persistence inspiring. Doaa’s account begins with the most horrific point of her harrowing escape from Egypt on board a smuggler’s boat headed for Italy. The boat has sunk, Doaa’s fiancé has died and she, terrified of water though she is, is hanging on to life while also hanging onto a baby and a toddler in the sea. From there, Fleming takes us back in Doaa’s life to her childhood in the city Daraa in Syria. Daraa was a prosperous town, sort of the breadbasket of Syria, and Doaa’s large family had a good life there. Her father had his own barbershop, and Doaa and her sisters attended school and enjoyed their extended family and friendships. Doaa was perhaps a little different from her sisters. She was shy but she was also stubborn, insisting that her goal was not to marry as most young women did, but rather to go to university and make something of herself, perhaps even become a policewoman! Syria under Bashir al-Assad was an improvement from the reign of his father Hafez al-Assad, but Bashir’s true colors came out after several years of drought and the beginning of the “Arab Spring” fed into unrest and uprisings in 2011. Doaa witnessed peaceful demonstrations in the street being put down with force as government troops lobbed tear gas and opened fire on the people. Doaa and some of her friends began to participate in demonstrations, and Doaa’s descriptions of the violence around her are vivid and frightening. Then one day, the tanks came rolling down Doaa’s street and the siege of Daraa began. For 11 days, citizens were prisoners in their own homes, without food, water or electricity. Government troops could enter and search at will and would smash possessions and take what they wanted. When the siege was lifted, the streets became more dangerous, with snipers firing and young women being abducted and raped. Doaa’s parents decided for their children’s safety to leave Syria for Egypt. This was no easy task, as it required money for fees and bribes as well as papers and help from friends or relatives. The journey itself was long, hard and draining. For Doaa it was especially sorrowful leaving Daraa, and she describes her weeping and her longing to return with great feeling. This is her home, her country, and part of her wants to stay and fight, but Doaa was only about 16 at this time and had to go with her family. In Egypt, Doaa and her family were pleasantly surprised by their reception. Egyptians were warm and welcoming at first. They provided food, housing and jobs for their Syrian brothers. Doaa went to work to help her family while her younger siblings were able to attend school. In Egypt, Doaa was introduced to her cousin’s friend Bashem, and a romance began. Then the political situation in Egypt became complicated as the Morsi government, which had welcomed Syrian refugees, fell. Demonstrations increased and anti-Syrian refugee sentiment and violence took over. Once again, Doaa and her family found themselves in danger. Bashem, now Doaa’s fiancé, convinced her that the two of them should make a run for Europe, as many of Bashem’s friends already had. It was not possible for them to get visas or documents to travel legally, and the only way to get asylum in places like Italy or Sweden was to be in those countries and request it. Then one could try to get one’s family over safely. Doaa, who was terrified of water and generally disinclined to uproot, felt the urgency to get out of Egypt. Her younger sisters and mother were being harrassed and threatened to the point where leaving the house was dangerous. Doaa agree with Bashem — they had to deal with smugglers and get out. Doaa’s descriptions of dealing with smugglers should be an eye opener to readers. Truly, only a very desperate person would put his or her life in the hands of such people. Not only was the expense of such travel exorbitant, but smugglers were sometimes in cahoots with authorities and turned over refugees to police. Moreover, the boats used for transport were overcrowded and in disrepair, and there was/is a very real danger of piracy on the sea. Doaa’s description of the boat sinking and the deaths of those around her is absolutely horrifying. And it’s important to remember that the people taking this risk were well aware of the possibility of not making it across the sea alive. How desperate would you have to be to do this? The fact that this young woman survived the wreck is nothing short of a miracle. After being rescued, Doaa found herself in Greece, where locals and the UNHCR came to her assistance. Doaa’s physical and psychological health had been damaged by her ordeal, but thanks to their help, she was able to recover and even work toward getting her family together again. Thanks to UNHCR, Doaa and her family were able to get to Sweden, and Doaa now dreams of becoming a lawyer so that she can fight for justice. I wouldn’t bet against her. Share the post "Nevertheless, She Persisted"
This sounds like an extremely important work right now. I think it is. And it’s very well written, too. I want every high schooler to read it and explain to their dumb Trump-voting parents why they’re wrong. One of my reading challenges this year (which I’m having a tough time finding the desire to actually do) is to read a debut author. I believe this is Melissa Felming’s first work (from a few minutes of internet sleuthing) so I’m hoping to get this one read this year for that challenge, and just because.